Our company is a reckoned entity engaged in offering an exclusive range Stainless Steel Fastener for Automobile Industry to our valuable clients. The fasteners are manufactured using supreme quality materials under the supervision of skilled professionals. Apart from this, our offered fasteners are available in various forms and sizes as per requirements of our clients. Available at industry leading prices, these fasteners are used in various industrial applications like petrochemical industry and pipe & tubing industry. 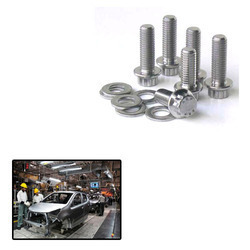 Looking for Stainless Steel Fastener for Automobile Industry ?